Maintaining a uniform walking speed is essential to keeping the application rate relatively uniform throughout the operation. A higher travel speed will result in a lower application rate. Maintaining a uniform spraying pressure is also essential both for keeping the application rate and the droplet size uniform during the application. Lowering the spraying pressure leads to higher application rates, and larger droplets. Maintaining the optimum spraying distance between the nozzle and the target. It is more difficult to keep travel speed, pressure, and spraying distance at optimum levels when using a manual sprayer than a motorized sprayer that moves at a set speed and has a set boom width. With manual sprayers, the travel speed will likely vary depending on the walking pace and the physical stamina of the person doing the spraying (at the beginning of a work day versus at the end of the day), and the topography of the area where the spraying is done (slopes, surface conditions, etc.). Having a metronome or beeper can help with keeping a walking speed constant. Most of the manual sprayers do not have pressure gauges or pressure controls. The pressure drops continuously as you spray. If the sprayer is not repressurized through intermittent strokes of the pump, the pressure will drop, lowering the application rate. Conversely, if the pump is pressurized excessively, the application rate will be increased while creating smaller drift-prone droplets. Both will result in waste of pesticides or poor control of pests. Lastly, with manual sprayers, it is difficult to keep the nozzle height uniform throughout the application. It is very likely that due to arm fatigue, the nozzle height will be closer to the target at the beginning of the spraying compared to at the end. To maintain uniform deposition of chemical on the target, either hold the nozzle steady at a constant height and walk back and forth, or swing the nozzle in a steady, sweeping, overlapping motion. The directions on the chemical container label tell a user which application rates give the best results. However, proper application rates will be attained only if sprayers are in proper working order and are calibrated correctly. 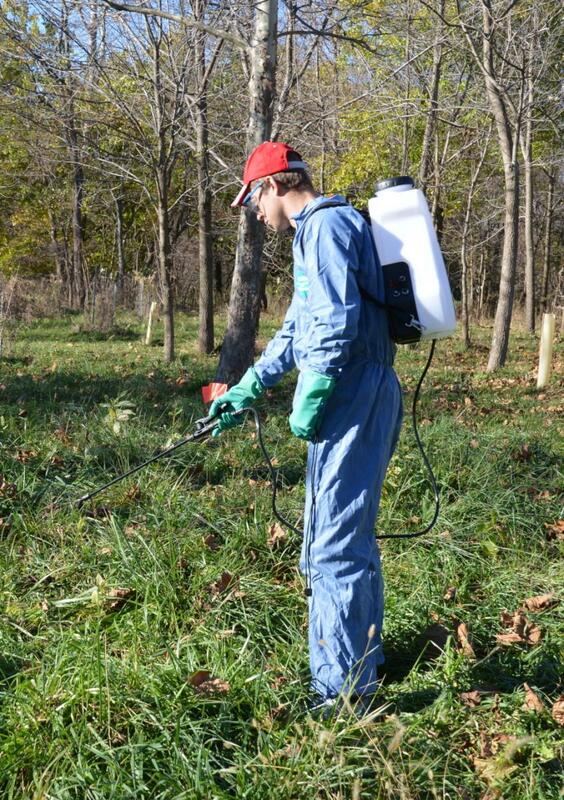 If the sprayer is not accurately calibrated, too little or too much chemical may be applied, resulting in unsatisfactory efficacy or damage or death of the target being treated (such as tree seedlings, shrubs, or lawn). This fact sheet describes the steps for calibrating manual (backpack and hand can) sprayers. 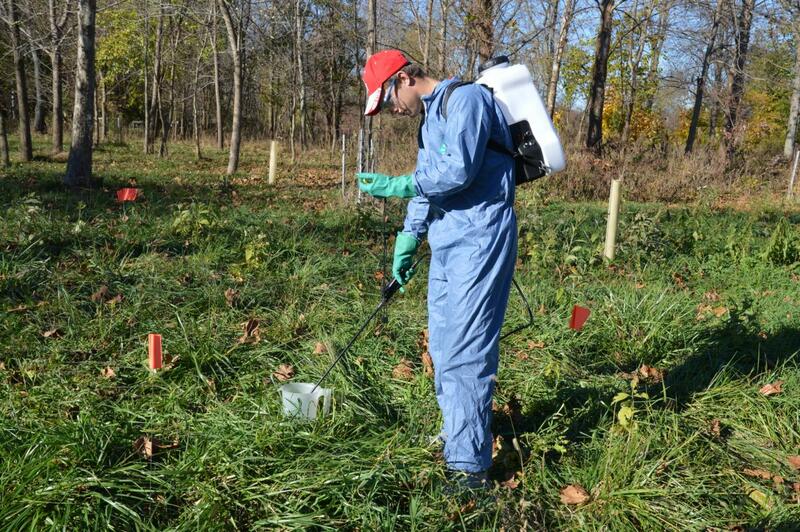 Calibration of large boom sprayers for field crops, and small, tractor-driven sprayers for forestry and turf sprayers are discussed in two separate Ohio State University Extension fact sheets (FABE-520 and FABE 529, respectively). Use the following link to search using the publication numbers given above: ohioline.osu.edu/findafactsheet. There are several ways to calibrate a manual sprayer. Use the one calibration method that you are accustomed to, if it happens to be different than the procedure outlined in this publication. Regardless of the method used to calibrate a sprayer, certain measurements will have to be taken, and some important operational principles mentioned in this publication should be followed to achieve maximum efficacy from the chemical applied. Step 1. Measure and mark off an area equal to 1,000 square feet (such as 20 x 50 feet). Step 2. Make sure the sprayer has been cleaned and thoroughly rinsed. Add a measured amount of water to the tank, spray the area and then measure the amount of water remaining in the tank. The difference between the amount in the tank before and after spraying is the amount used per 1,000 square feet. An alternative method is to record the time required to spray 1,000 square feet and later catch and measure the spray from the nozzle (or nozzles) used for the same time period. Step 3. Compare the measured application rate with the recommendation on the pesticide label. If the difference between the recommended rate and the measured rate is greater than 5 percent of the recommended rate, adjustments should be made to bring the application error within +5 percent of the intended (recommended) rate. The most practical way to correct an application error is to change the walking speed. If needed, adjustments in spray pressure can also be done, but it may take larger changes in pressure to eliminate large application errors. Do not operate the nozzles outside the pressure range recommended by the nozzle manufacturer. If reasonable walking speed and/or pressure changes will not bring the application error below 5 percent of the intended (or recommended) rate, the only option left to achieve the desired application rate is to replace the nozzle with one that will produce the desired application rate under normal operating conditions (speed and pressure) of the sprayer. However, replacement of the nozzle may not be an option depending on the type of manual sprayer you are using. You would like to spray a chemical at a rate of 1.5 gallons per 1,000 square feet (based on label recommendations). To determine the actual application rate, you marked off an area 20 by 25 feet (500 square feet). It took 2 minutes for you to spray this area. Then you sprayed into a bucket for 2 minutes and measured the amount of liquid in the bucket. It was 5.5 pints. What is the application rate in gallons per 1,000 square feet and gallons per acre? What is the percentage application error? First, convert 5.5 pints per 500 square feet to gallons per 1,000 square feet. Your application rate is 1.38 gallons per 1,000 square feet. It should have been 1.5 gallons per 1,000 square feet. This is an 8 percent application error, which is unacceptable (more than 5 percent of the intended rate). One way to remedy this problem is to slightly reduce your walking pace, and repeat the calibration steps outlined above until the application error (variation between the intended application rate and the actual measured rate) is less than 5 percent of the intended rate. Although trial and error will eventually get you to the correct walking pace, you can also calculate the correct walking pace to cut down on time that may require to complete the trial and error approach. Here is how you do the calculations. Since covering the 1,000 square feet calibration ground took you 2 minutes as in the previous example, resulting in an under application by 8 percent, to eliminate this error you need to reduce your walking pace by 8 percent. That means, instead of 2 minutes (or 120 seconds) it took you to cover the calibration ground, you now need to slow down by 8 percent of 2 minutes. That is equal to 9.6 seconds (120 x 0.08). So, the exact time it should take you to cover the calibration ground of 1,000 square feet is 110.4 seconds (120 – 9.6 = 110.4). Doing this should eliminate the application error, resulting in an application rate of 1.5 gallons per 1,000 square feet as recommended on the chemical label. The second option to eliminate the application error of 8 percent, if changing walking pace is not practical, is to change the spray pressure. In the case of the example situation above, a slight increase in pressure (by repressurizing the tank) will be necessary to increase the application rate from 1.38 gallons per 1,000 square feet to 1.5 gallons per 1,000 square feet. Remember to repeat the calibration steps outlined above each time you change either the walking pace or the pressure, until the difference between intended application rate and the actual measured rate is less than 5 percent of the intended rate. 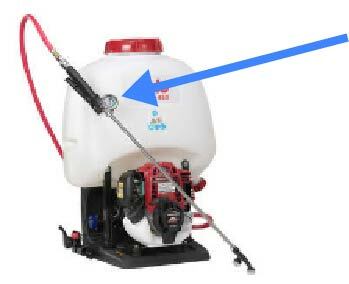 The nozzle at the end of the spray wand is there to help you accomplish three things that determine success in pest control: volume of liquid flow required per minute; spray pattern (flat-fan, cone, spray angle); and droplet size. Chemical labels usually do not indicate the type of nozzle you need to use. Choosing the wrong nozzle may not only lead to waste of chemical applied, it may also lead to ineffective pest control. With backpack sprayers, most commonly used nozzles are either flat-fan or cone type, as shown in the picture below. 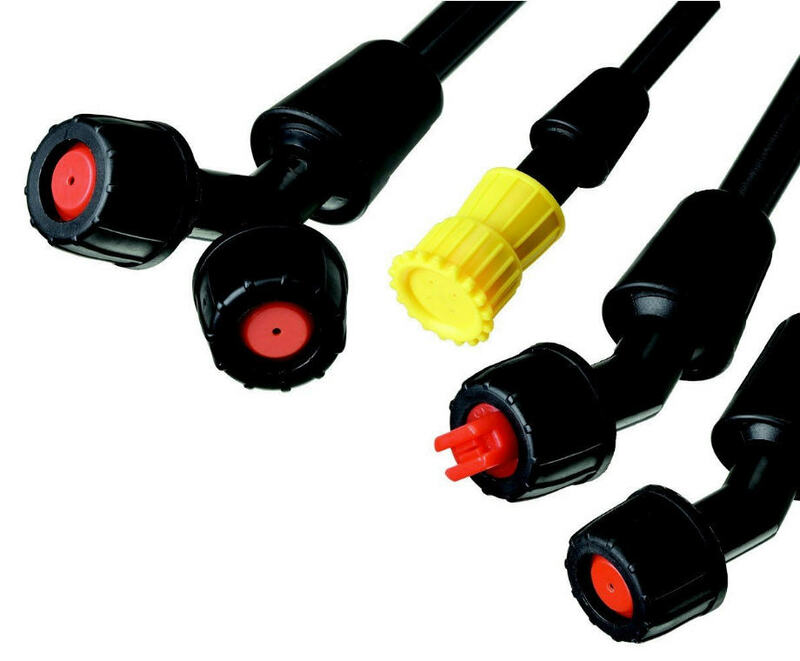 There are fittings available to put two nozzles on a wand, and nozzles also available to produce a number of solid streams (the yellow nozzle shown in below). 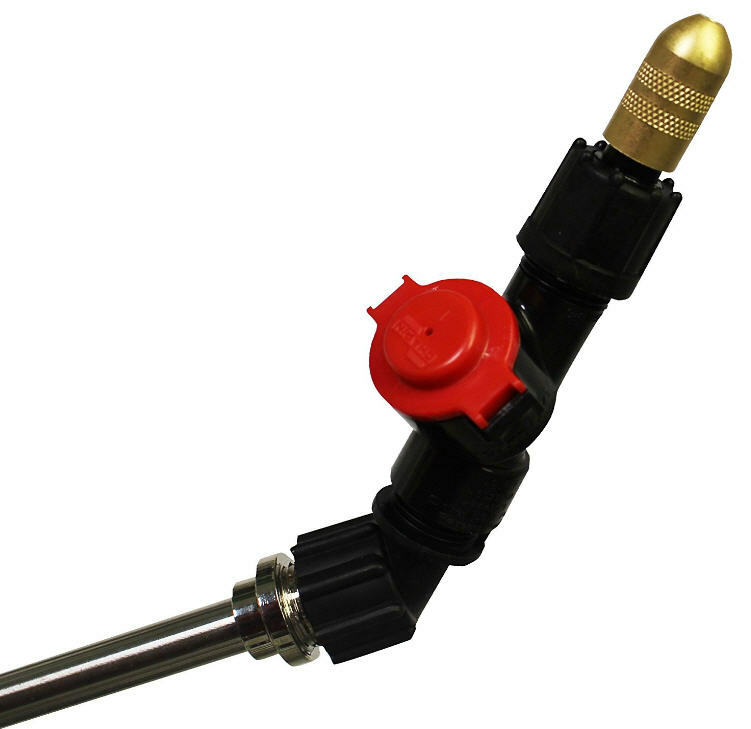 Variable pattern nozzles (shown in the figure on the left, below) are most popular with hand can sprayers, but it is also used with backpack sprayers. 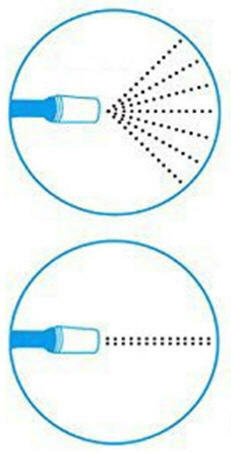 By twisting the nozzle in one or the other direction, the spray pattern can be changed from a single solid stream of large droplets with a narrow fan angle or smaller droplets with a wide spray angle, as shown in the figure on the right. A pressure check valve attached to the wand avoids dripping of the spray when the hand trigger is let go to stop spraying. With the check valve shown in the picture above, no dripping occurs when the hand trigger is let go. Nozzle choice is sometimes determined by the type of spraying you are doing. For example, if you are doing band spraying, meaning your target is in a row (like a row of vegetables, or tree seedlings) within a certain width, you would want to choose an “even flat-fan” nozzle that is designed to provide a uniform (“even”) coverage of the chemical sprayed across the complete band width. If you are doing broadcast spraying to cover a wide area, then a regular flat-fan nozzle is best for application of fertilizers and herbicides. A cone nozzle is likely to produce better results when applying fungicides or insecticides because it produces somewhat smaller droplets than a comparable size flat-fan nozzle. However, because it produces relatively higher number of small drift-prone droplets, you need to pay more attention to drift when using cone nozzles. For detailed information on nozzle selection (type and size) for different applications, read the OSU Extension fact sheet FABE-528 “Selecting the Best Nozzle for the Job” available online at ohioline.osu.edu/factsheet/fabe-528. Flow rate—the higher the pressure, the higher the flow rate of the nozzle; or inversely, lower the pressure, lower the nozzle flow rate in gallons per minute. Droplet size—the higher the pressure, the lower the droplet size, resulting in a higher number of drift-prone droplets (as shown in the photograph below. Spray angle—spraying at pressures lower than the recommended pressure for a given nozzle will likely result in narrowing of the spray angle, as shown in the figure below. This may cause streaks of untreated areas. For the reasons mentioned above, it is best to maintain the recommended spray pressure during the entire spraying time. Changes in spray pressure cause changes in droplet size. 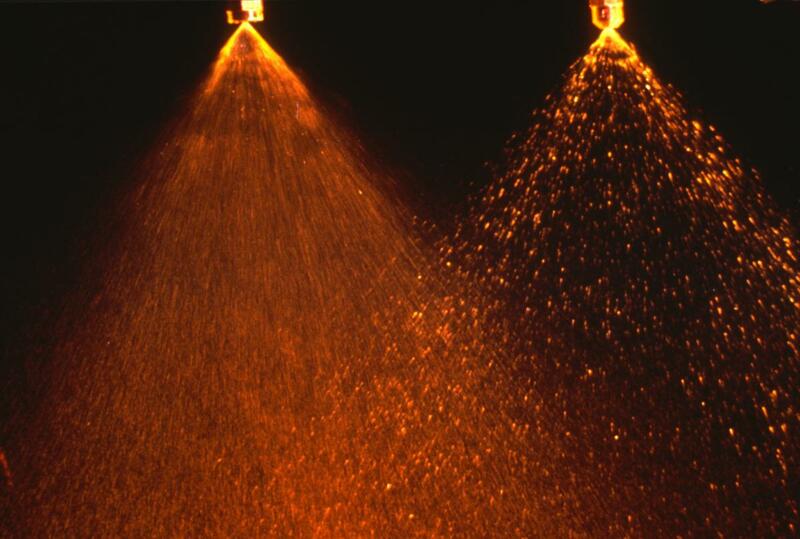 Operating nozzles at very low pressures causes narrowing of the spray angle. Unfortunately, most manual sprayers don’t come with a pressure gauge attached somewhere on the sprayer, usually on the wand. Knowing if the pressure is maintained during the entire spraying time, or when making precise changes in the application rate, or spray droplet size will be very difficult without a pressure gauge. Therefore, it is highly recommended that you purchase a manual sprayer with a good quality (glycerin-filled) pressure gauge. 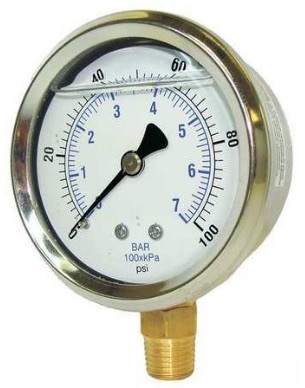 As with any equipment part, pressure gauges don’t last forever. Therefore, purchase a spare, good quality pressure gauge to check, from time to time, the accuracy of the gauge on the sprayer. Some labels may mention the most effective droplet size (fine, medium, coarse, etc.) for that product. Nozzle manufacturers provide information on droplet size classes for each nozzle under different pressure settings. Having a pressure gauge on the sprayer makes following the label recommendations about the droplet size much easier. Getting the right amount of spray mixture and the active ingredients on the target is not enough to achieve effective pest control. Some other important factors, such as how the chemical is deposited on the spray target, is as important as the amount deposited. 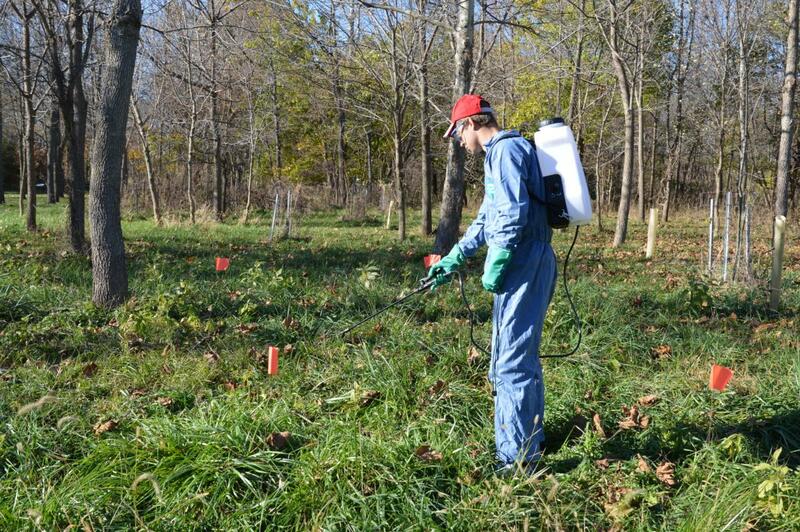 Uneven distribution of chemicals on the target is likely to cause streaks, as shown in the picture below, or generally unsatisfactory weed, insect, and disease control. 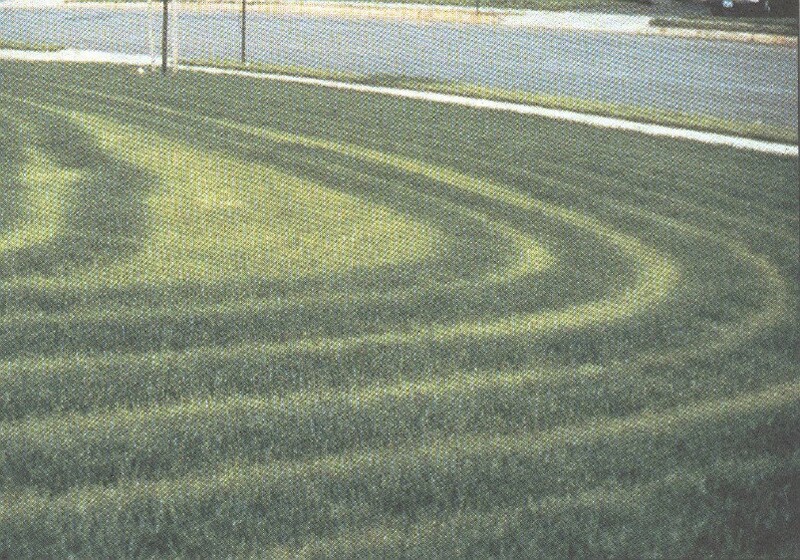 The streaks shown in the picture are a result of not having sufficient overlap between spray passes, most likely caused by the nozzle being held too close to the ground. How Much Chemical to Mix? 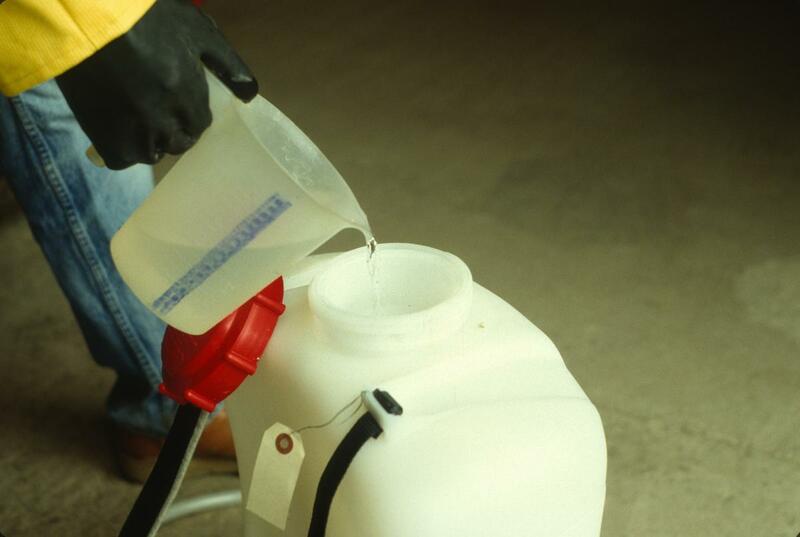 Although your sprayer may be in top shape, and you may have calibrated the sprayer frequently, you could still end up with a less than satisfactory pest control if the correct amount of chemical was not put into the tank. Labels give two types of application rates: volume of spray mixture (pesticide and water) applied per unit area (gallons per acre, ounces per 1,000 square feet, etc. ), and the amount of actual chemical applied per unit area (ounces, pints, or quarts per acre or square feet). The first requirement can be attained by proper calibration and operation of the sprayer. The second label recommendation not only requires proper calibration and operation of the sprayer, but it also requires that the spray mixture contains the right concentration of the actual product applied. That means, you need to know how much chemical to add to the sprayer tank, depending on the size of the sprayer tank. Sometimes a full tank is not needed to cover a small area. This requires much less chemical to add in the tank than when you are preparing the correct mixture of chemical and water for a full tank. 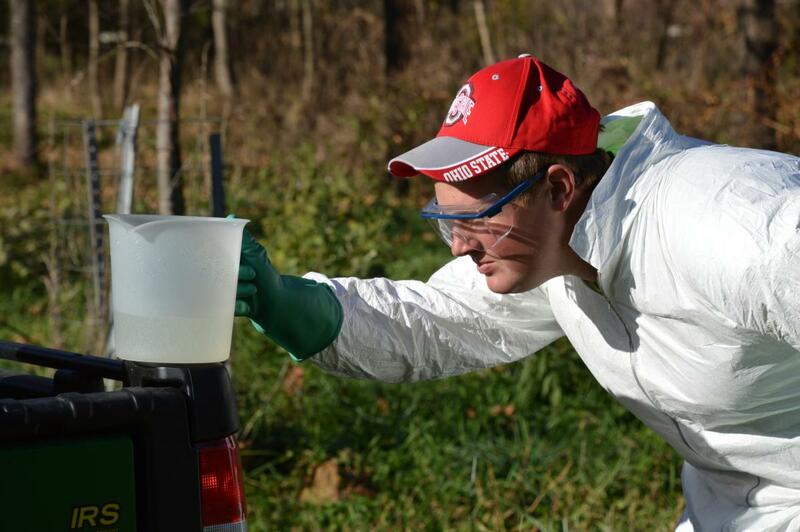 If you need help in making the calculations to determine the chemical amount to add to the tank, read the OSU Extension fact sheet FABE-530 “How Much Chemical Do I Need to Add to Sprayer Tank?” available online at ohioline.osu.edu/factsheet/fabe-530. Calibrate sprayers often to determine the correct walking pace and the pressure needed to satisfy the label requirements given for application rate. Follow the simple calibration procedures outlined in this publication. Practice consistency of your walking speed. Walk the area you set several times for calibration (a known area) at the calibrated pace and record the time. Practice until you can consistently walk this area within a specific time needed to apply the correct amount of material. A ticking stop watch or timer will improve your pacing. To avoid streaks of untreated horizontal target surfaces, tie a weighted cord or chain to the wand near the nozzle. This can serve as a height gauge to maintain a set distance from the nozzle to the target. Attach a pressure gauge to the spray wand and check how fast the pressure drops. Count the number of seconds needed for the pressure to drop 5 psi. Count the number of pump strokes needed to return the pressure to the proper level. For backpack sprayers with a gauge, determine how fast you need to pump to keep the gauge pressure constant while spraying. To avoid arm fatigue and pressure drop when using manually operated backpack sprayers, consider purchasing one that has a built-in electric battery. No manual pump stroke is needed when using these sprayers. It is very important that safety must be kept in mind always when working with chemicals, especially pesticides. Although the pesticides in a spray mixture may slightly affect the flow rate and droplet size of nozzles, this affect is negligible. Therefore, for safety reasons, it is best to use clean water when calibrating sprayers. Even when using clean water for calibration, take all the safety precautions as when spraying pesticides. Always try to minimize oral, dermal, or inhalation exposure to chemicals. Wear protective clothing when calibrating, spraying, and cleaning equipment. Goggles and rubber gloves are standard equipment when handling pesticides. Some chemicals may require respirators. Therefore, check the label of each chemical you use, and follow the PPE (personal protective equipment) statements on all pesticide labels when mixing and applying pesticides. Also check the sprayer operator's manual for recommended procedures regarding safe use of equipment. The author thanks Dr. Peter Ling, Associate Professor at Department of Food, Agricultural and Biological Engineering at the Ohio State University; Dr. Dave Shetlar, Professor at Department of Entomology at the Ohio State University; and Kathy Smith, Forestry Program Director, Ohio State University Extension, for reviewing this publication and for their editorial contributions.